Desert Springs Golf Desert Springs This long lost part of Andalucia boasts the best winter climate in Spain, making it an attractive all year round destination for golf, tennis and water sports. Local accommodation Desert Springs Golf Course is listed below. Vera (4.3 km from Desert Springs Golf Club)Just 7 km from Vera Playa’s beaches, Hotel Terraza Carmona offers rooms with free Wi-Fi. Located in the centre of Vera, this hotel features a restaurant and a 24-hour reception. Each simply decorated room at Hotel Terraza Carmona has air conditioning, a TV and a private bathroom. You can enjoy a range of Spanish cuisine in the Carmona’s restaurant. The hotel has a communal lounge area with a TV and internet access. Vera (3 km from Desert Springs Golf Club)Featuring an outdoor swimming pool, spa, and a fitness centre, Be Free Thalassa Vera is located in Vera. It offers air-conditioned apartments with a TV. All apartments have simple décor and tiled floors. The living area includes a sofa and a dining table, while the kitchen comes equipped with an oven, hob, dishwasher, coffee machine, and kitchenware. There is 1 bathroom with a bath or shower. 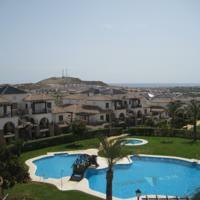 The property also offers an indoor pool and a garden area. Private parking on site is also available. You will find a range of shops, restaurants, and bars within a 5-minute drive of Be Free Thalassa Vera. The nearest beach at Playas de Vera is 1,5 km from the property, and Vera Town Centre is 10 minutes’ drive away. 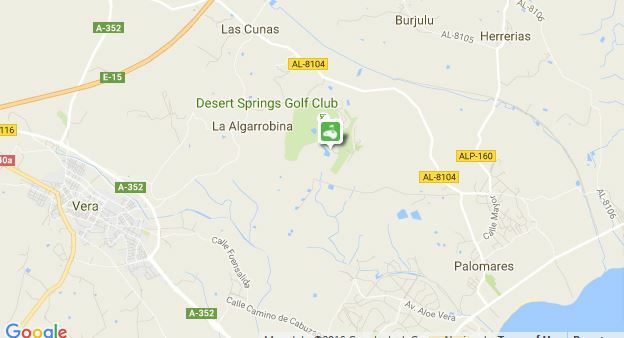 Antas (8.2 km from Desert Springs Golf Club)Located in Antas, 15 km from Playas de Vera beaches, Hotel Mi Casa offers meeting and banquet facilities, free WiFi, shared lounge with TV. The rooms are equipped with a flat-screen TV, air conditioning, heating and desk. Every room has a private bathroom with a bathtub and complementary toiletries. Mi Casa Restaurant offers breakfast, daily menus and dinner. The hotel also features a garden and terrace. It provides guests with a 24-hour front desk and concierge. There are 2 grocery shops 2 km away and Desert Springs Golf Club is 15 minutes by car. El Playazo, a nudist beach in Vera, is 15 km from the hotel. The 18-hole, Indiana, course opened 2001. The Clubhouse is built above the lake near the 18th hole and will afford the golfer a refreshing and comfortable surrounding after a round of golf on this jewel in the famous desert of Almería. VIDEO AÉREO CENTRO NACIONAL DE GOLF. This long lost part of Andalucia boasts the best winter climate in Spain, making it an attractive all year round destination for golf, tennis and water sports. Desert Springs Golf. It is set in a dramatic desert landscape of rocks, arroyos, springs, and cactus, which border and punctuate the lush green fairways. Only 20 mins drive from the old Moorish town of Mojacar and 2 ½ hours drive from the ski slopes of the Sierra Nevada and with Almeria International Airport a mere 40 minute drive away. 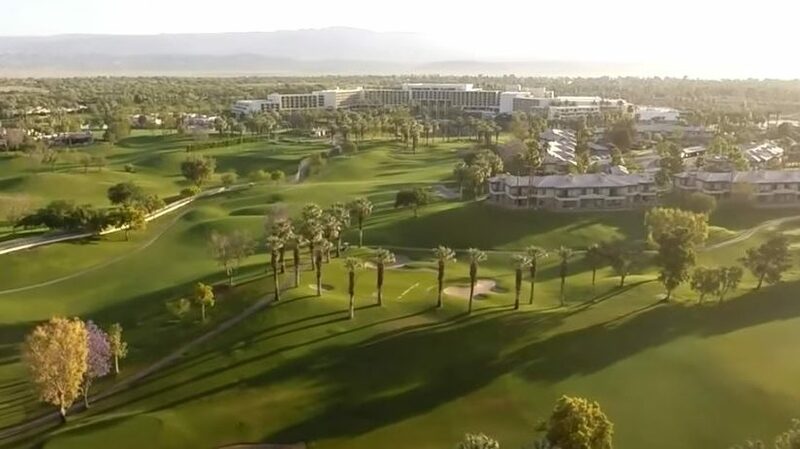 The Indiana course is the first desert course in Europe and has been built to the full USGA specifications and quality standards of the now famous desert courses of Arizona and California. It presents unforgettable views of the rugged mountain ranges and golf of such a dramatic nature that it can be said to have taken not only desert golf but also golf in general in this part of Spain to a new level of excellence. Golf Rules Quick Reference 2016. Golf rules quick reference practical guide book.